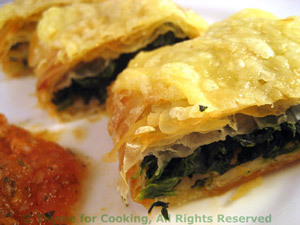 Spinach Strudel, Carrot Tomato Sauce, gourmet starter, Thyme for Cooking. This is based on a recipe from Pru Leith's Cookery School book. We've eaten at her restaurant, Leith's, in London; wonderful food but we were happy to be on an expense account! Filo (phyllo) is in either the dairy or freezer section of the supermarket. If the filo is frozen remember to thaw earlier. Use a soft brush if possible. The Spinach: If fresh, take any thick stems off of the spinach. Rinse well with cold water - even if it doesn't need it, we want the water. Put the rinsed and drained, but not dry, spinach into a large saucepan. Heat over medium heat about 5 minutes, stirring occasionally, until it wilts. Remove, squeeze dry and roughly chop. If using frozen, thaw and squeeze dry. Put spinach, cheese, marjoram and nutmeg in a bowl and mix well, separating the squeezed spinach and fluffing it to combine with the cheese. The Strudels: Melt the butter. Lay the sheet out flat and brush all over with melted butter, starting with the edges (they dry out fastest) and working in. Lay the second sheet on top and brush with butter all over. Spoon the spinach mixture about 2" (5cm) from the narrower edge. Roll the end over the top and continue rolling it up, like a jelly roll. Brush the top with the remaining butter and bake at 400F (200C) for 12 - 15 minutes, until the pastry is golden brown. When done, remove to a cutting board. Cut in large slices and serve, with Carrot Tomato Sauce on the side. Roughly chop the carrot and celery. Cook in rapidly boiling water for 12 - 15 minutes, until tender. Drain. Put carrots, celery, basil and tomato sauce in a blender. Purée until smooth. Pour into a bowl, stir in yogurt and set aside until ready to use.